After a tough few races I am finally feeling like everything is starting to get back on track. So I thought it would be a good time to do a race report and get back to blogging. 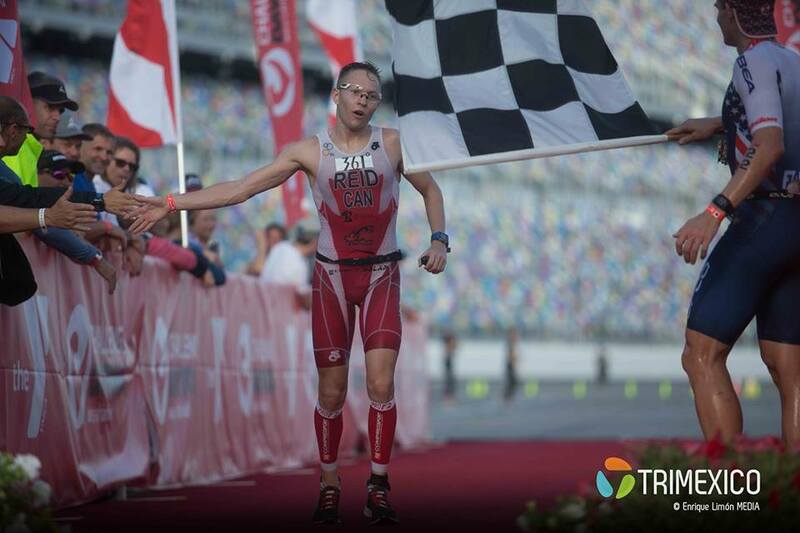 After racing Shanghai 70.3 and taking two weeks off from training, I really felt that I had more to give. I was not feeling burnt-out or over-trained. Shanghai made me feel that competitive spirit again and I was able to put myself in the mix for most of that race, finishing in 6th place. This spurred me on to sign up for Challenge Daytona. After the two weeks off, I had 5 weeks to get myself ready. I went back to my old style of training of high intensity, backed up with long tempo sets. As the weeks went on I started to see times that I had not seen all year and knew I was ready for a good race. Everything was starting to fall into place. It has been over 2 years since Challenge was present in North America, so it was a big deal with athletes coming to chase the “World Bonus Points”. This enabled Challenge Daytona to field a very strong professional race. Race day started as usual for me: I was up at 4 AM, I ate breakfast and then chilled. Challenge set up a shuttle to the race site with a nice private area for the professionals to relax in before the race. It was called the Green Room. Since we were at the Daytona Speedway we had access to all kinds of facilities including treadmills and stationary bikes. At 6 AM we gathered in the Green Room to get an update, because a large storm cell was coming and there would be changes and delays. The professional race was going to be delayed until 11 AM with the age groupers racing a modified course at 7 AM. We would have the course to ourselves and it would be multi-laps. However, the final decision about the format of the race was still being debated. These sorts of delays can make for some or the hardest kinds of races. Trying to stay focused, re-calculating your fueling and making sure you do not get stomach trouble, these concerns make it a balancing act. Challenge quickly got the professionals some extra food and we waited. Luckily I was able to get a ride back to my hotel (thanks to Alicia Kaye and Jarrod Shoemaker) and chilled there. At 10 AM we were given the new race distance and course. 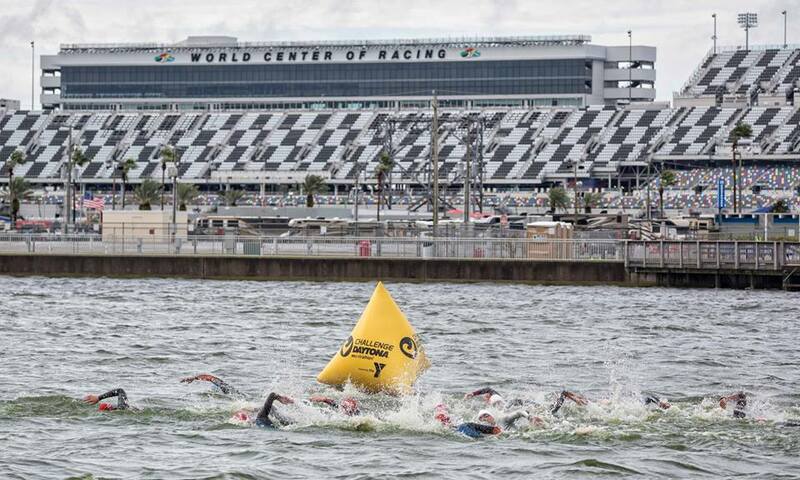 It was to be a two-lap 1600m swim, fifteen-lap 60km bike (all on the Daytona speedway track), and a two-lap 13.2km run. It was a very cool alternative: basically 2/3 of a 70.3 distance. I started to get re-warmed up for the race. I went outside for a jog in the rain to see what the course would look like, and as I finished thunder struck again! Every one was ordered to take shelter, and the race was delayed further until 12:45. Finally after yet another short warm-up the race was under way! The sun was starting to come out, but the winds were picking up. As the race started it was a big shock to my system. I had done my best to warm up but I was still not able to jump right into it. During the swim, I lost a lot of the group going into the wind for the first 350m. I was not happy with myself but just refocused on bridging the gap to the lead group over the next 450m. I was able to use the tail wind to my advantage, and as I got out of the water to start the second lap I had bridged up to the lead group. I tucked in for the rest of the swim coming out the water in 7th place with Jarrod Shoemaker and Kevin Collington. As we rode onto the Daytona speedway, the track was starting to dry. Over the 15 laps a lot of position changes happened. But as things settled down I found myself in 5th or 6th position switching with Santiago Ascenco. The winds were in our face on one of the straight sections of the track, and pushing us on the other. I treated it like climbing a hill, gearing down every time I went into the headwind, trying to hold a steady power and cadence as I went around the track. I had a one of my strongest bikes this year and felt very in control, averaging 280 watts for 60km. I started the run in 5th place only 20 seconds behind 3rd place Santiago Ascenco. I went after it for the first 5km and was able to run down Cameron Wurf who had come off the bike almost 3 min ahead of me. This put me in 4th place and I could see 3rd up the road. I was able to catch Santiago Ascenco by 6km into the run, but every time I tried to make a move around him he would counter my attack with his own surge. After multiple attempts I just could not get past him and he finally got away from me. I was able to hold it together and finish the race in 4th place. Looking back at this race I feel that I just missed my “outcome goal” of making the podium, but I executed many of my “processes goals”. I really see this as a huge step for me in terms of getting back to where I know I can and should be: competing for the win. I have to give a huge shout-out to the Challenge Daytona Race crew and volunteers! They easily could have canceled the race, and they may have just made something even more epic. Thank you for following along. I am keeping the fire going and preparing for my next race on January 13!